The community, which depends heavily on the pool to attract tourists, is currently benefiting from the Permian Basin oil boom. Summer is coming. The kids are about to get out of school, and that means trips to the pool. 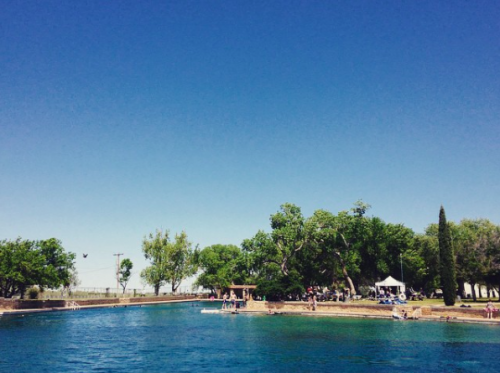 In Texas, there is one pool that stands above the rest – the pool at Balmorhea State Park, a true desert oasis. Generations of Texans have gone west to cool off in the spring-fed pool near the foothills of the Davis Mountains. This year, there’s a problem, though. The pool is closed indefinitely. The Texas Department of Parks and Wildlife will remove the rest of the concrete apron around the diving board, and make sure that the deck that holds the diving board is structurally sound. This is, after all, an old pool. It was built in the mid-1930s by the Civilian Conservation Corps. “You know it’s very very likely that it’s just erosion from every year, the water is swirling around that area and it just may have eventually eroded away enough of the cement that it failed. But that is again my speculation,” Rose says. Rose says she couldn’t speak to whether seismic caused by oil and gas activity in the area may have contributed to the damage. It’s unclear how long the repairs will take, how much they will cost, and what this might mean for the town of Balmorhea. After all, we are entering the high season for tourism there. What does no pool mean for the few motels and restaurants in the area? Pat Brijalba, a Balmorhea native and head of the local economic development corporation says he hasn’t heard much about what’s going on with the pool repairs. “I hope they can repair it as quickly as possible,” Brijalba says. The pool’s closing won’t affect Balmorhea this year as much as it would have in years past, Brijalba says, because the area is currently experiencing an oil boom. Brijalba says motels in Balmorhea remain full because of the oil economy, making it difficult for tourists coming to area festivals to get a room. Visitors from Pecos or Fort Stockton who make day trips to Balmorhea will probably be affected by the pool closure, Brijalba says. This entry was posted in KRTS News, KXWT News and tagged balmorhea. Bookmark the permalink.